We propose an adaptation of DiscoSnp for RadSeq data. Order(s) of magnitude faster than Stack or IPyRAD. Applied on real biological data, RAD data from 259 specimens of Chiastocheta flies, morphologically assigned to 7 species, all individuals were successfully assigned to their species using both STRUCTURE and Maximum Likelihood phylogenetic reconstruction. 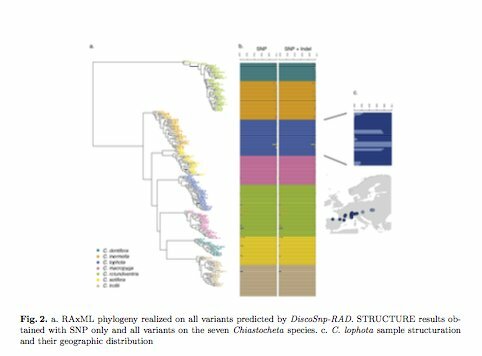 Moreover, identified variants succeeded to reveal a within species structuration and the existence of two populations linked to their geographic distributions.